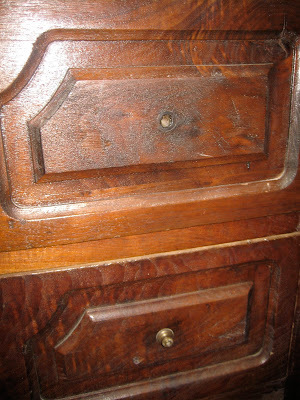 I have an old dresser that was given to us by my grandmother- inlaw. She graciously gave it to us when we got married and had zero furniture. It's so old and cool! It lives in our living room and houses our DVD's. The wood is beautiful and in great shape. It has a marble top. Check out that dovetail joinery! I really love it. But I felt bad for it because when she gave it to us it was missing a drawer pull. And during our last move another one fell off. Despite glueing it back on it has fallen off once again. 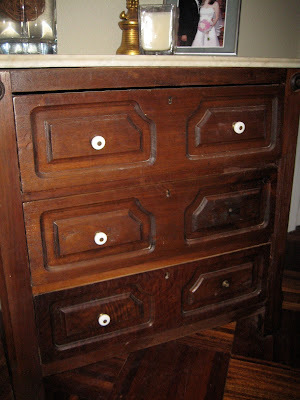 So I thought I'd give our dresser a little TLC with a simple update- some new Drawer Pulls! Of course this was an excuse to make the trek over Fancy Drawer Pull Heaven (AKA Anthropologie). 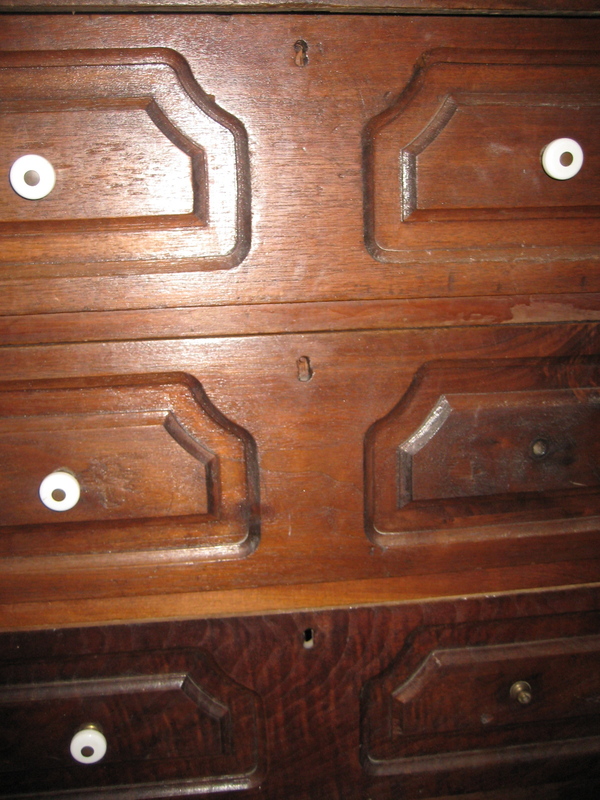 ﻿There are a ton of awesome drawer pulls there! I spent some time sorting through them trying to decide which color and style to go with. And trying to not fall in love with the $8 or even $12 (!>@#!) ones. Green to match the curtains? Blue to match the accent color in my new rug? I unscrewed the old ones and put the new ones on. Quick, easy, and I think it looks great! Hooray for easy updates! Have you done a quick update that makes a big difference? That's not jewelry, girl, that's BLING!!! 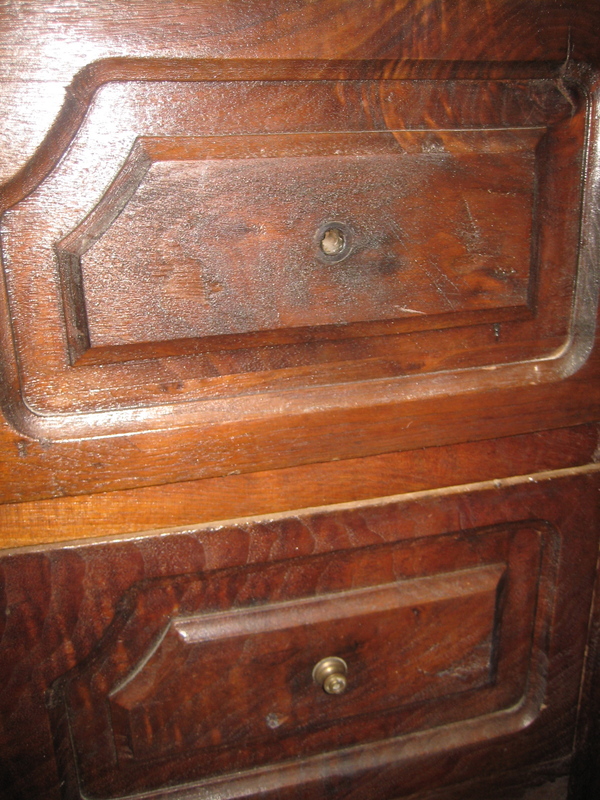 Really made a HUGE difference and I speak for all the "old timers" when I say I'm REALLY GLAD you didn't paint that lovely piece of furniture. ohhh nice...really like what you choose...works really well with dresser! wow...simple change and it looks so updated and chic! 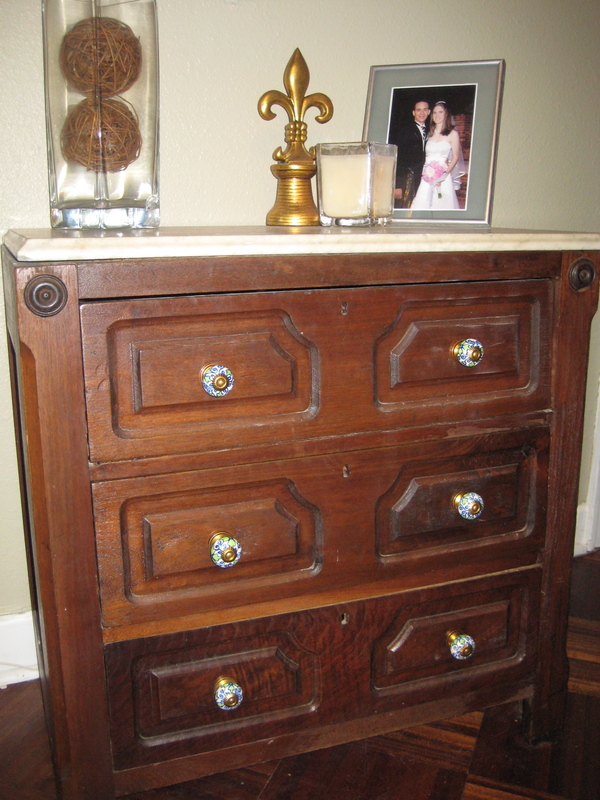 This dresser is awesome! What a Blessing to have this given to you. You did an excellent job on the pulls. They are so pretty! Love this! My mom has a set of drawers with a marble top that is very similar. 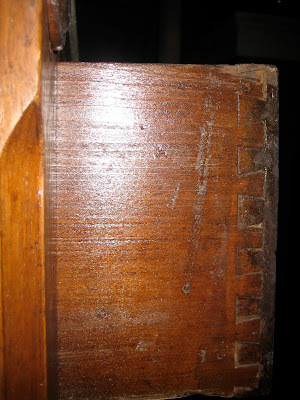 Question - Did you find that the length of the bolts on the drawer pulls were too long? I've been lusting after some fancy drawer pulls from Anthro, but the bolts look too long, like they'd poke out on the other side too far. 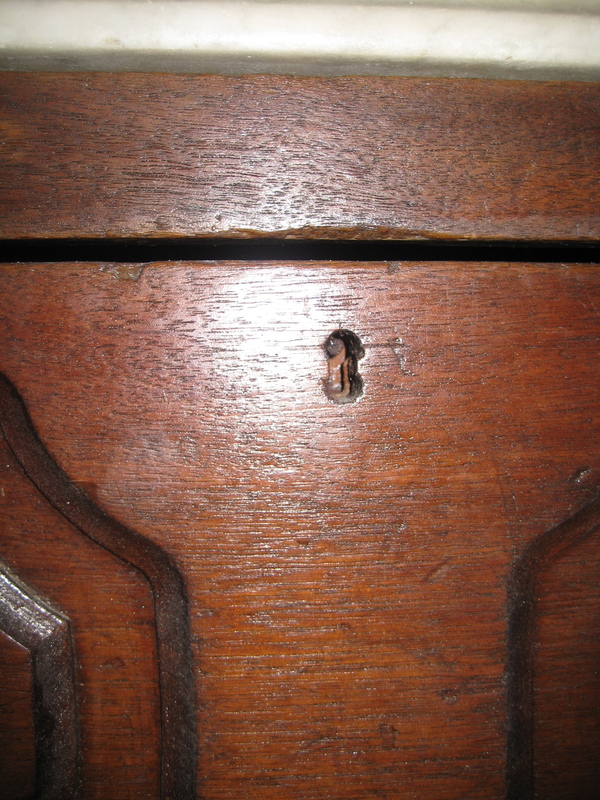 I have to laugh at you calling Anthro Fancy Knob Heaven. My husband calls it That Knob Store. 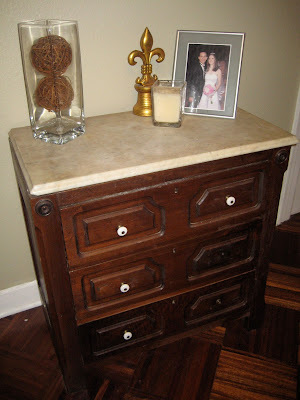 Love that dresser, my mom used to have furniture that had marble tops, that is what this reminds me of...don't paint it, it is a gem like it is. Happy VTT! what a great piece! I am sure now when you look at it you smile because it is all put together now with the knobs! I do not know how you ever made a selection out of so many pulls. What you picked looks very nice. 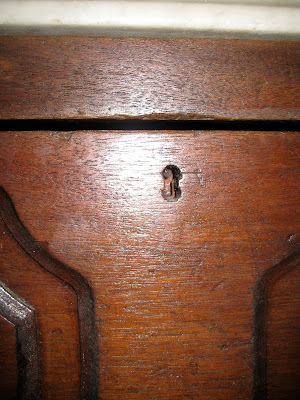 You have a vintage treasure with this chest. I really love what you've done to the dressing drawer. It looks fabulous. Thanks for sharing. 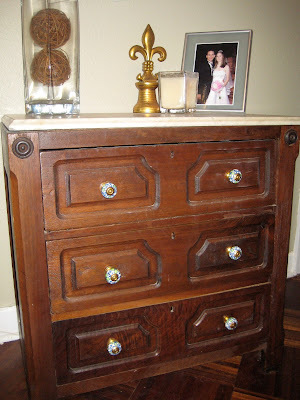 Beautiful piece, love the knobs! Looks fabulous!! 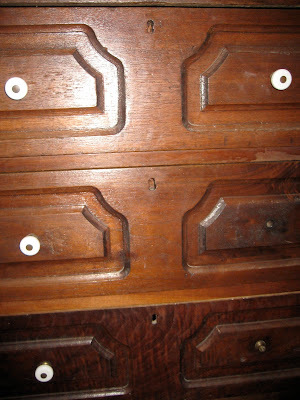 Drawer pulls and the such add such great detail to pieces! I'm just amazed that you were able to make a choice between all those cool knobs! ;} I couldn't!!! Great hardware! I love that you kept the piece as is & didn't paint it. I recently found similar hardware (for less) at Hobby Lobby.